The main costs of living for garment workers are food and rent; both are rising much faster than wages. The overall inflation level is around 10%. So workers are demanding pay increases of up to 50% and are calling for rent controls to be implemented. These are the main demands of the recent struggles which began in mid-May (see earlier report) and have now exploded again to new levels. Though there has been also been trouble at nearby Naragayanj, the unrest is centred on Ashulia where about 500,000 garment workers are employed in 350 factories. Sunday 10th June, Narayanganj, 10 miles south-east of Dhaka; at 11am workers of the Reck Work garment factory walk out on strike and block the Narayanganj-Adamji-Demra highway with burning tires. They are demanding a pay rise and subsidised transport facilities. Monday 11th June, Ashulia, an industrial suburb of Dhaka; at 9am thousands of workers of the Artistic Design factory (a packaging subsidiary of Hameem Group, who were the focus of last month's unrest) walk out, demanding higher wages. They block a 3-kilometre stretch of the Dhaka-Tangail highway for several hours. They are later joined by thousands of other workers from nearby factories; bricks are hurled at nearby garment factories and 25 vehicles damaged. One hundred other local factories also close to try to avoid becoming involved in the unrest. Police baton charges, leaving 30 workers injured, eventually cleared the road by 1.30pm. The Hameem Group employs around 24,000 workers, including 4,500 with Artistic Design Ltd.
Tuesday 12th June, Ashulia; almost half of the 350 local factories remain closed for the day. From 9am there are further clashes between cops and garment workers, with police rubber bullets and tear gas met with bricks and stones. 10 factories are attacked, and 80 workers injured, 10 with rubber bullet wounds. 15 vehicles are vandalised, including the jeep carrying Industrial Police Director General Abdus Salam. Hafiza Akter, who works in a factory of Hameem Group, told New Age that the workers were demanding pay hike to cope with the abnormal increase in the prices of essential commodities. It is tough to maintain family with the minimum wage of Tk 2,500 fixed in late 2010, she said. The road was finally cleared around noon when members of the paramilitary Rapid Action Battalion and armed police reinforced the industrial and local police. Take Rahima (her real name withheld), for instance. She earns Tk 4,500 a month, and pays Tk 1,000 per month for her one-room shanty. Her landlord now wants Tk 1,400. Over the past several months, she had to skip eggs, the almost one and only source of protein for low-income group people. “Four eggs cost Tk 40 now. When my wages were increased [in late 2010] they cost Tk 24,” she says as she explains why she cannot afford eggs any more. With such a price spiral, the inflation graph has swung wildly and remains at a high level. On a 12-month average basis, the inflation rate accelerated to 10.76 percent in May, up from 8.67 percent in the same month a year ago, according to the Bangladesh Bureau of Statistics (BBS). Rahima and her fellow workers were shattered by the skyward journey of inflation. owners of the factories at Ashulia decided to resume production today upon assurance from the government and labour leaders that there would be no harm to their factories. But, despite yesterday's decision, workers turn up for work at 7.30am to find Artistic Design and many others factories closed. They again block the road and are gradually joined by thousands of workers from 200 other factories. Various barricades are built on main roads with logs and tires. Police use baton charges, water cannon and hundreds of rubber bullets and tear gas canisters in clashes with workers. By early afternoon the workers are dispersed and traffic resumes. The inability of these 'labour leaders' to deliver yesterday's "assurances" of a peaceful workforce today shows how little they are in control of events on the ground and how self-organised and autonomous from official mediation these struggles generally are. With unions still banned from the workplace strikes are necessarily wildcats by nature, with a limited influence of the marginal union organisations. The workers are tired of years of broken promises on pay while their bosses grow ever-richer. With their purchasing power declining to new lows, workers are demanding a rise of between Tk 1,500 and 2,000 per month. Currently, a garment worker gets Tk 3,000($36) to 5,500($61) a month. Shamima Akhter, a worker of a factory of the Ha-Meem Group, said the management of the factory assured the workers that they would increase their wages but did not do so. Another worker of the factory, Rozina Begum, said that now they only get Tk 4,100 to 4,500 per month by doing general duty. Months before they earned a total Tk 7,000 to 8,000 per month by doing overtime but now they have no overtime duty so they are facing trouble in maintaining their families. It is certainly odd and unusual that none of these mysterious "workers’ leaders" or their organisations have been named in news reports. "We want to increase our salary as no one can run his family by minimum salaries as the price of commodities increase day by day," Rahima, a knitting operator of a factory told The Independent. ... the government formed an inquiry committee ... to identify the mischief makers. The committee was formed at a tripartite meeting of the Labour Ministry and representatives of garments factory owners and workers. Ruling party lawmaker Talukdar and the State Minister for Home Affairs, Shamshul Haque Tuku, met protesting workers at Artistic Design Ltd in Narasinghapur at 8:30 am. As the news spreads that the bosses and the state were more intent on punishment rather than a definite pay settlement furious workers return to the streets, blocking the Dhaka-Tangail and Nabinagar-Kaliakoir highways. The Minister for Home Affairs promises a pay rise next month and monitoring of workers' rents but this is not enough to satisfy workers' demands for immediate concrete improvements. Intense fighting breaks out as the area becomes a battleground, police using tear gas and rubber bullets, but they fail to disperse the workers. There is an attempt to set a factory on fire and over 100 vehicles are damaged, including the torching of a TV channel's microbus (media film crews are becoming regular targets of protesters, as footage is being used to identify demonstrators). Workers make barricades at several points along the highways with burning tires and sewage pipes; in securing their territory, workers take temporary control of most of the area. Another 100 workers are injured. Cops later manage to disperse the occupation. ...the Bangladesh Garment Manufacturers and Exporters Association (BGMEA) on Thursday threatened to shut all readymade garment factories at Ashulia in Savar if the ongoing workers' unrest is not contained by Sunday. “We will close all of our units first at Ashulia and gradually across the country if the violence continues,” Shafiul Islam Mohiuddin, president of Bangladesh Garment Manufacturers and Exporters Association (BGMEA), said at a press briefing yesterday. He urged the government to take action against the workers who vandalised factories and blocked the roads there for the fourth straight day yesterday. “A national and international evil power wants to destroy the industry and the government and exporters know who instigated the general workers to do vandalism,” Mohiuddin told the briefing at the BGMEA office in the capital. Several resolutions were agreed on in the meeting mediated by Tuku. Contacted, Brig Gen (retd) Mohammad Ali Mondal, director of the project at Ashulia of Ha-Meem Group, told The Daily Star that the workers would get an increment from next month. The owners will also pay for the treatment of the injured workers and that the workers will get the full month's salary although production remained suspended for four days, he added. Also, the workers were promised that the government would see to it that their house rents at Ashulia do not go up further. Thurday 15th June, Narayanganj; thousands of garment workers stop work and stage rallies in factories demanding pay rises; some also take to the streets and clash with cops, leaving around 50 people injured. Workers there state they are acting in solidarity with their fellow workers in Ashulia. 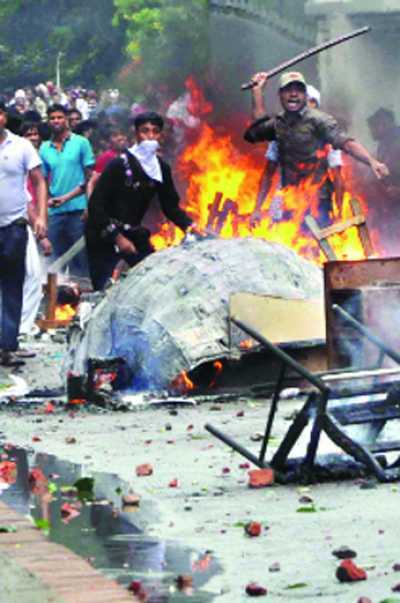 Friday 15th June, Ashulia; The unrest continues. Saturday 16th June, Narayanganj; workers withdraw their labour at 10am; roads are blocked and fierce clashes occur with police, injuring four workers with rubber bullets as workers brick the cops. It takes until 2pm to clear the roads. Saturday 16th June, Ashulia; another day of unrest, with 50 injured and roads blocked for several hours. 4,000 police remain stationed in the area. "It won't be possible to reopen the factories until those responsible for the unrest in the industry are given exemplary punishment," BGMEA President Shafiul Islam Mohiuddin told a press conference. "We will shut all factories across Bangladesh if the situation so demands," he threatened. The conference followed a meeting of BGMEA (Bangladesh Garment Manufacturers and Exporters Association) and the Bangladesh Knitwear Manufacturers and Exporters Association (BKMEA). "Considering security of people and the industry, we cannot but shut the garment factories in Ashulia area for an indefinite period in line with Clause 1 of Article 13 of the Bangladesh Labour Act," Mohiuddin said. If necessary, Mohiuddin said, the government should ensure exemplary punishment to them who are destroying the country's economy by enacting a new law so that no one can play game with the industry. He alleged that conspiracy, both from home and abroad, is on to destroy the industry which now has turned into a 5500-factory industry from one factory. 1) to attempt to convince foreign buyers - worried that their Corporate Image will be tarnished by association with sweatshop exploitation - that it is external forces rather than poor internal industrial relations and extremes of exploitation that are the cause of unrest. 2) To blame the convenient bogeymen of neighbouring rival countries; both Pakistan (from whom Bangladeshi national independence was won), pro-Pakistan Islamic Bangladeshis and also rival garment exporter nations such as overbearing big brothers China and India. 3) To target western NGOs whose reformist agenda is to expose the pay and conditions of garment workers. This thorn in the side of the garment industry and its image abroad is generally seen as an embarrassment and as contributing to the present difficulties of convincing the US to grant duty-free access to its markets - the US Ambassador had earlier this month expressed "deep concern" over failure to resolve unrest in the industry. Expressing both garment bosses' image concerns and their enduring paranoia, this has now been taken to the level of absurdity - with UK charity/NGO War on Want and UK newspaper The Observer being blamed as "behind the unrest"! After reading out a written statement, he blamed a non-governmental organisation (NGO) and a UK magazine for the unrest. "There is an NGO named War on Want. Besides, The Guardian's magazine The Observer has some influences," he said in reply to a query on who they think were behind the unrest. Referring to some newspaper reports, BKMEA Vice President Mohammad Hatem said some units of the industry had failed to pay wages. "The global recession has caused the situation. And it is not possible for us to hike salary in this situation," he added. The effects of rampant inflation on living conditions are therefore completely ignored. Nor were all grades of employee wages increased by 80% in 2010 - and the increases made then were still insufficient by any humane measure. This is why thousands of workers continued to demonstrate and riot after these increases were set. The BGMEA president also said that the announcement on pay hike by the state minister for home affairs was an individual decision of the Ha-Meem Group. ‘The Ha-Meem Group advanced its yearly increment from November to July. But this was not a decision of other owners,’ he added. Sunday 17th June, Narayanganj; after recent unrest in the workplace the Sinha Textile Group announces a two day closure of its factory. Police are deployed to prevent further trouble. Sinha employs 40,000 workers. Sunday 17th June, Ashulia; thousands of workers gather outside the closed factories. They demand an immediate pay rise and immediate reopening of the factories. Barricading the roads, there are more clashes with cops - resulting in 50 people, including cops, injured. Police raid workers hostels and houses and also attack bystanders and shoppers. Already subject to regular state harassment, leaders of the main opposition BNP party are now also conveniently being blamed for the unrest, with some today charged with the unlikely role of orchestrating the workers' disturbances! Extremely unlikely, as many politicians of both the BNP and the ruling Awami League are owners and investors in the garment industry. Monday 18th June, Ashulia; 15 workers are arrested in police raids in the Ashulia area. Charges are obstructing police in the discharge of their duty, vehicle vandalism and arson. A dispute at one factory employing 4,500 workers becomes, in less than a week, so generalised and intensified in Ashulia that it leads to the drastic measure of the locking out of 500,000 workers from 350 factories by panicked bosses. This shows, once again, the extraordinary solidarity of garment workers that continues to sustain their struggles in the face of such harsh material conditions. With the exception of 'design classics' such as Levi's jeans, fashion commodities have a stylistic built in obsolescence. Since the 1990s, supply processes and consumer behaviour patterns have become more diverse and fast-changing. Catwalk shows, their clothes horse celeb models and latest designs have in recent decades become media phenomena visible far beyond fashion industry insiders, affecting consumer preference. Influenced by supermarkets developing their own cheap clothing lines, "fast fashion" emerged as fashion 'seasons' grew from two to half a dozen a year; speed of supply became an essential component of competition to get versions of the catwalk's latest styles into the shops and onto the racks faster than one's rivals, with a faster turnover through the shorter seasons. Fast turnaround from design drawing to delivery - for the cheapest price - are what Western buyers demand of Asian garment factories. The workers of Ashulia and Narayanganj are fully aware that every day they strike costs their bosses millions in loss of buyer confidence, contract penalty clauses and much increased transport costs of switching to flight rather than boat delivery to make up lost time. The factory bosses presumably intend to use their lockout to starve the workers back to work on the worst possible terms. But this is a high risk strategy for garment bosses, driven by desperation and the absence of other immediate options. As financial losses accumulate, so does loss of reputation and of reliability in the eyes of international clothing buyers demanding those vital fast turnaround supply times. It seems the lockout cannot be sustained for very long; losses are so far estimated at Taka 500 crore ($75 million) and rising at a rate of $10 million daily. Once again, the machinists are rebelling against the machine. 5] These recent events, and the fact that workers are here demanding to resume work, should be enough to refute the claims of some 'communisation theorists' that Bangladeshi garment workers display a definite 'anti-work ethic' or tendencies and engage in struggles 'without demands'. In several years of observation we have seen no evidence for these claims, which appear to be only a projection of the theorists' ideological preferences/preferred conclusions - of what one wants to find confirmed in events. 6] Nor is cheap clothing made to physically last as clothing- yet much of it ends up with its synthetic fabrics stubbornly refusing to bio-degrade in Western landfill sites. We want to increase our salary as no one can run his family by minimum salaries as the price of commodities increase day by day. To quote a laid of garment industry worker from Montreal upon sharing this piece. "Well at least I know my job went to someone who knows how to use it". These recent events, and the fact that workers are here demanding to resume work, should be enough to refute the claims of some 'communisation theorists' that Bangladeshi garment workers display a definite 'anti-work ethic' or tendencies and engage in struggles 'without demands'. In several years of observation we have seen no evidence for these claims, which appear to be only a projection of the theorists' ideological preferences/preferred conclusions - of what one wants to find confirmed in events. I think you are right here, and they are actually just "taking their desires for reality". Narrowly blaming only the Bangladeshi garments owner will hide the real side of the story.Except few big local Merchandisers most of garments owner works as secondary supplier.i.e take the orders from big companies and can keep limited profit. Main profit share goes to International buyers and the Big local Merchandisers. The real side is the international buyers(foreign buyers) who demands very low price to the big Merchandisers for these cloths and keep the major part of profit. So in a fear of loosing the order marchandisers have to agree. So buyers, merchandisers are happy and also we(customer) are happy who get the Jeans in a price of a burger. left is the poor worker who get even 10c/hr . Taking this issue if someone stops BD cloths or force the owners pay or stop bussiness, the real loser will be actually small garments owner and the poor workers of Bangladesh. Because the Big buyers then will make their money from Africa or India i.e anyhow find another cheap source and leave the 6 million worker out of job. So Pressure should be towards the international buyers and the Big local Merchandisers to change their habit of keeping major share of profit and make them leave it for the workers ,who do the real hard job. There has been massive consistent growth in the industry for decades and a lot of Bangladeshi bosses have got very wealthy off it. Yes, there is a chain of supply from businesses employing thousands to backstreet sheds employing a handful and not all are rich (though the smaller operations, facing at that level more intense competition and smaller profit margins, can often be some of the most ruthlessly exploitative). But, as the figures quoted below show, labour is such a small portion of overall cost that a significant wage increase would add little to retail price and wouldn't impoverish the bosses, foreign or native. True, it is competition imposed firstly largely by Western buyers who seek to always drive prices down further - but this can't be used to excuse the greed, brutality, dangerous working conditions, malnutrition, slum housing etc imposed by the rich local garment bosses on millions of workers and their dependents. As mentioned in the article, many politicians have business interests in the garment industry - so it is neither solely an economic or political issue, but a class issue of relative distribution of wealth. The garment workers can only apply pressure from their own situation/location in the factory and on the street, so which particular sector of the ruling class in the supply chain pay more to increase their wages is unlikely to be of great concern to them. ...the percentage of the retail price of garment that is accounted for by labor costs. Although estimates vary by product and location of production, it is clear from published academic research, that labor costs typically constitute 1-3 percent for a garment produced in the developing world. Hence, large increases in labor costs do not require correspondingly large increases in retail price. For example, for a typical sportswear garment, doubling wages would increase retail price by roughly 1-3 percent; tripling wages would result in price increases of 2-6 percent. These estimates assume that all of the increased cost is passed along to the consumer. If some of the costs are absorbed by exporters, retail price increases would, of course, be commensurately smaller. Here are a few more illustrations based on academic research on the relationship between apparel production costs and retail prices. • For men’s casual shirt manufactured in Mexico and sold in U. S., direct labor accounts for 1.6 percent of the final retail price. Doubling the wages of all non-supervisory workers would result in an increase of roughly 1.6 percent. • For men’s knit shirt manufactured in the Philippines and sold in the U.S., labor costs, including the salaries of floor supervisors but not higher management, represent 1.56 percent of the final retail price. Doubling wages would result in a retail price increase of 1.54 percent. • For an embroidered logo sweatshirt manufactured in the Dominican Republic and sold in the U.S., the production costs accounted for by direct and supervisory labor represent 1.29 percent of the final retail price of the garment. Doubling wages would result in an increase of 1.27 percent.